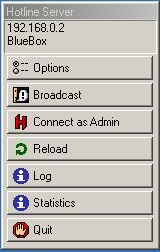 The Hotline server application receives connections from the Hotline Client (software) and may also list on trackers running the Hotline Tracker (software). A default installation of the server software features a guest account for general public access and a full administration account allowing you to manipulate files, create/modify user accounts, etc. The official Hotline server software was released under Macintosh and Windows, though the protocol was unofficially available on other operating systems such as *nix variants. This page was last modified on 5 April 2019, at 23:23.